Once again a new year is upon us. And though spring is just around the corner, it’s not soon enough for this Florida boy! In fact, I write this with record low temperatures nipping at my toes. Fishing in January is 100% dependant on the weather, and any consistent patterns will give fish the opportunity to feed. This is also a great time to clean up your gear, spool new line, and catch up on kayak maintenance neglected in preparation for spring. 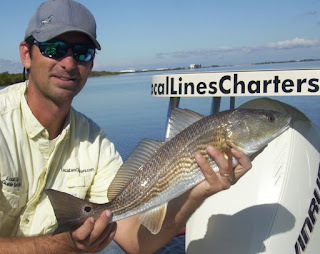 Yet another kayak fishing seminar from LocalLinesCharter.com is set for February 2. This seminar covering the ins and outs of kayak fishing is free to the public, and everyone from beginners to experts will receive priceless tips and tactics. Catch “The Ins and Outs of Kayak Fishing” on 2-2-2011, 6:00 pm at Boaters Exchange in Rockledge, right off US1. You just can’t go wrong sea trout fishing this time of year. The canals and deep holes of the entire region will produce steady action on average (14-20 in.) sea trout, and a cast in the quietest, muddy-bottomed canals could have you latched on a true Gator trout of 6 pounds or better. The best way to connect with these willing fish is a 1/8oz. Mission Fishin jig head with an Assassin paddle tail, curl tail, DOA Shrimp, or Gulp soft plastic. Slowly bounce this rig along the bottom and wait for the telltale thump of a lethargic trout. Dead end canals, especially ones with a natural shore lines, will be loaded; so catch them up! With natural bait you can free-line a shrimp or add a bobber to keep it right of the bottom. 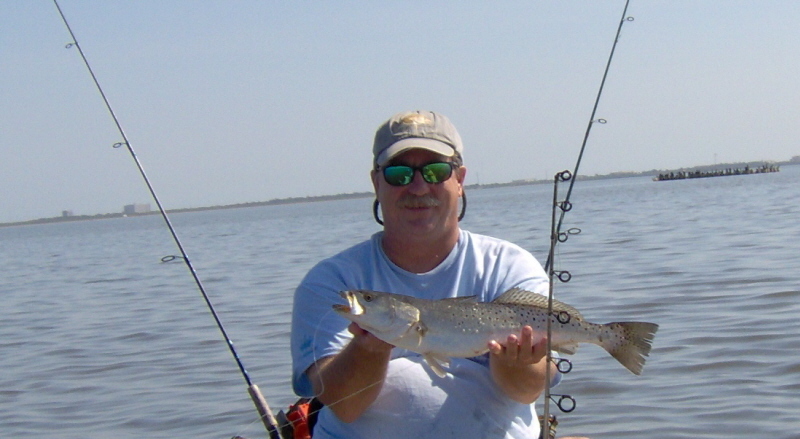 Though, a fresh cut-bait soaked on a circle hook might just account for the biggest seatrout. The canal trout will hit early in the day when lures are fished slowly, and if a flat is close by you can follow the fish out of the canal as the sun warms the shallows. Best soft plastic colors are chartreuse, white, and natural. January’s persistent west winds will beat down the surf, and allow adventurous kayak anglers access to some amazing Pompano action. These silver sided, tasty gamesters not only grill up nicely, but they fight like crazy on light river tackle. The troughs, washouts, and coquina areas that cover Brevard’s beaches from the sand to 100 yards out can all produce Pompano at one time or another. A good sign that any given stretch of beach is holding Pompano would be the presence of sand spikes, rods that resemble bamboo shoots, and salty beach anglers sipping coffee. Beware though, keep some distance. Pyramid sinkers pack a heavy punch. Not to mention we one-up our stationary friends with mobility and agility to chase the marauding Pompano schools. 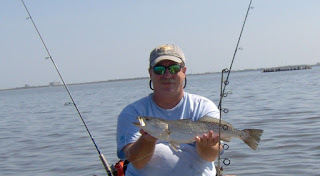 Your standard trout and Redfish rod will do fine throwing the small Pompano jigs that I like to use. Any small buck tail (synthetic works well), speck/crappie jig, or a Doc’s Goofy Jig type lure in pink, white, and yellow will catch Pompano. All of these types of lures can be rigged single or tandem, and should be worked back with short vigorous snaps of the rod. Impart this action “puffing” the sand bottom to mimic the Pompano’s favorite treat, the sand flea. Though it is not necessary, one could tip the Pompano jig with cut clam or fresh shrimp (peeled) for a sweetener. Tipping will improve the chances of hooking the whiting, sheepshead, and black drum that share the same habitat as Pompano. Be sure to move and search-cast for the Pompano that could show at high tide right on the sand, or the back side of a sandbar at low tide. Also, be sure to rig a rod with lures like Clark spoons or Gotcha jigs incase the ravenous blue fish and Spanish mackerel that patrol the winter surf show up. So, grab your fishbag and some ice to keep those “pomps” fresh and try some Pompano fishing from your kayak! Tight Lines & Wet Paddles!